Rated 4 out of 5 by Aaron98 from Easy to operate This is a great generator capable of powering a home during an outage. It is easy to operate and the electric start is a nice feature. I would have given it 5 stars except the first unit I purchased kept shutting itself off after 12-15 seconds of operation. The Generac customer service representative helped me trouble shoot the unit but it never operated properly. They recommended I take it nearly 20 miles to the closest service center. I opted to exchange the unit where I purchased it and the second unit operates perfectly. Rated 5 out of 5 by ScottHamburg from Saved New Family I live in the Suburbs of Buffalo where the winters are awful. I bought this Generator as protection for my family when we needed it the most. We lost power for almost a day, my new family, including my newborn son were able to stay warm. If you want a Power House of a Generator, that can run Fridges, Freezers, light stoves and ovens, and keep the heat on! This is the BEAST - I mean, best to get ;-) Running a Fridge, Freezer, Furnace, and several lights and Electronics, gas lasted 6 hours. Unit has 5 gal capacity. Rule of thumb is an hour a Gallon to be on safe side. I am a Generac Customer for life. GP8000e with COsense is an amazing unit. Thank you. Rated 5 out of 5 by Hag from Worked great! Living in a remote location in North Western PA. our power was always going out and with this years bitter cold I figured it was time to purchase a generator. 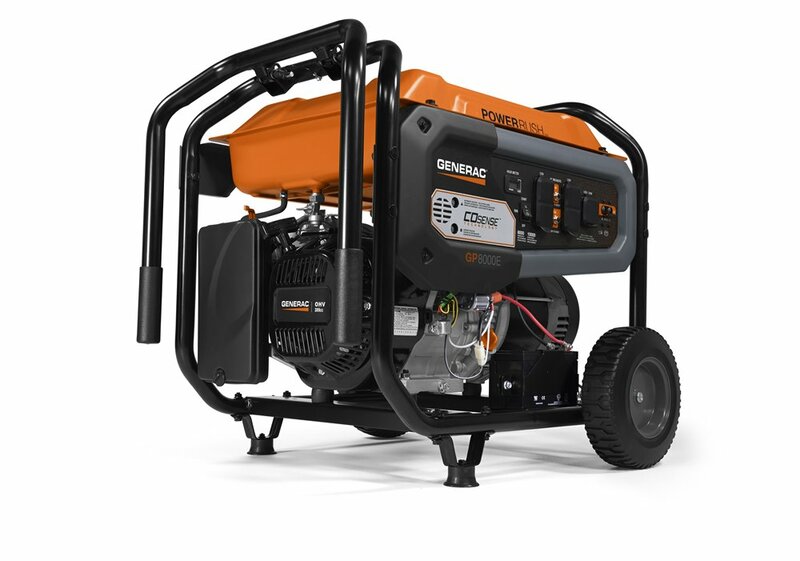 After speaking with a lot of people in my situation and electricians as well as the local power company it was clear a Generac was the way to go. I purchased the GP8000E. The electric company hooked up a connector to my meter that fit my 220 plug. The first time I had to use it was awesome. I plugged it into the meter pushed the start button and it powered my entire house. The only draw back was the wheel bracket on the frame broke. so I had to drag it into place from my shed as apposed to free wheeling it. Still it was pretty quite and after 7 hours of use still had almost half of a tank. I'm sold. Rated 5 out of 5 by Bkeeler2003 from Easy setup and easy starting Within 15 minutes of getting my new generac 8000 watt generator home I had it setup and running. Oil and battery included. Great quality and dependability. Rated 5 out of 5 by Concreture from Love it What’s not to like? Electric start, easy to move around, quiet engine and it looks great. Rated 4 out of 5 by NWD from Great Product Came with everything needed, was looking at this vs. Westinghouse with remote starter and chose this for availability. GP8000E CO-SENSE? is rated 4.5 out of 5 by 12.